California's SpaceX company expects to make a piece of history later when it re-flies a Falcon rocket. Traditionally, rockets are one-use only - all the elements of the vehicle are discarded in getting a satellite payload into orbit. Now, the firm is ready to put one of these "flight proven" vehicles on the launch pad again. 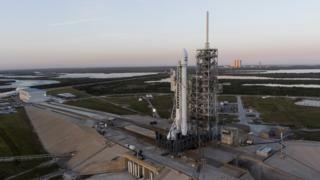 The window for a lift-off from Florida's Kennedy Space Center opens at 18:27 EDT (22:27 GMT; 23:27 BST). Only the lower segment - the first-stage - of the Falcon is "second hand". The upper-stage and the clamshell fairing that protects the satellite on the ascent are all new. It should have gone back up in October but the flight was postponed following the launch pad explosion of another of SpaceX's rockets in September. Re-using stages is part of SpaceX's strategy to lower the cost of access to space, and SES is getting a discount off the normal launch price, which is advertised at $62m. At the moment, the opportunities to fly the big telecoms satellites into orbit are limited by the availability of capable vehicles. The commercial launch industry is constrained principally to just three major providers and when one of these has a problem, as SpaceX did with its September anomaly, the "pipeline" to orbit for everyone gets squeezed. "This is not just an issue about money," emphasised Martin Halliwell, the chief technology officer of SES. "Will re-usability lead to cheaper prices? I hope so, but for us it's also about having a route to space," he told BBC News. "We've been waiting for six months now to fly SES-10, and that's because there was no other alternative opportunity. If we can start getting the rocket companies looking toward re-usability and going down this path, we should have much more flexibility in being able to launch our various different missions." Already, the next mission after Thursday (SES-15) looks like it will be delayed because of strike action in French Guiana, the home of Europe's spaceport and launch provider Arianespace. Obviously, reliability is a critical aspect to all this as well, and SES has had two individuals embedded at SpaceX to oversee the booster's evaluation. This work has satisfied the Luxembourg operator that Thursday's Falcon mission carries no additional risk. Certainly, no change has been required to the insurance package supporting the flight. "We would not risk such an important spacecraft, with such huge investment, on top of any rocket that we didn't believe is actually going to make it correctly into orbit," said Mr Halliwell. Getting away from expendable rockets has been a long quest. Famously, Nasa's space shuttle system was partially re-usable. SpaceX hopes its simpler Falcon 9 rocket can finally deliver a practical commercial solution. It believes its technology will eventually permit rapid turnaround, with boosters flying multiple times before being retired. Other players are following close behind. The Amazon entrepreneur Jeff Bezos already has a re-usable sub-orbital rocket and capsule system that he has successfully launched and landed five times. Mr Bezos now plans a recoverable orbital rocket called New Glenn. And United Launch Alliance, which puts up the majority of America's national security payloads, is in the process of designing a new vehicle that will return its engines to Earth via parachute. SpaceX will again seek to land Thursday's first-stage booster on a floating platform in the Atlantic. This will give the company's engineers further data on the durability of the Falcon's components and sub-systems.